In my opinion the original NeoAir sleeping pad was the biggest step forward in sleeping pad design in many years, and has been wildly popular, grabbing a ton of market share in the category. So how does Therm-a-Rest follow the largest sleeping pad success is recent history? By making it about 15% lighter while increasing the r-value (warmth) by 28%. It certainly works for me. Please read on for the details. 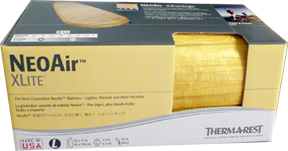 The NeoAir XLite sleeping pad (hereafter referred to as the XLite or pad) is Therm-a-Rest's newest version of the NeoAir. This one has replaced the original version and has quite a few changes. One thing that stayed the same is the construction of the pad. The outer shell is made of 30 denier high tenacity nylon that is a slightly translucent yellow. At first glance my XLite appears to be comprised of 47 air chambers running horizontally across the pad. But actually there are 188 chambers. This is because of the patent-pending Triangular Core Matrix technology that creates "an internal truss system" which Therm-a-Rest attributes their exceptional stability to. Each chamber visible on the top and bottom is actually a triangular wedge that goes to a layer of polyurethane-coated nylon in the middle of the bag. That means that for every chamber that is visible there is another inside the pad on each side of the internal coated nylon layer, plus two wedges not visible from outside. The triangular shape gives the pad structure and keeps it from squishing out of shape under the weight of the user. While the many small chambers give some insulation by creating dead-air space, the many surfaces inside also slow down and block the flow of warmth from the user's warm body to the cold ground and does the same to keep cold from the surface from moving up. To further the warmth-retaining properties of the XLite the air chambers and the center layer of nylon have been coated with a reflective surface, much like a Mylar space blanket. This reflects heat back towards the user. 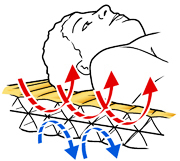 This graphic from Therm-a-Rest illustrates the concept. A couple of welcome additions are the inclusion now of both a stuff sack and a repair kit. The stuff sack weighs 0.6 oz (17 g). When folded in thirds and then rolled up the XLite is just a bit larger than a 1L Nalgene bottle, as may be seen above. I also held the pad up to a light to be able to view the reflective material inside the translucent nylon. 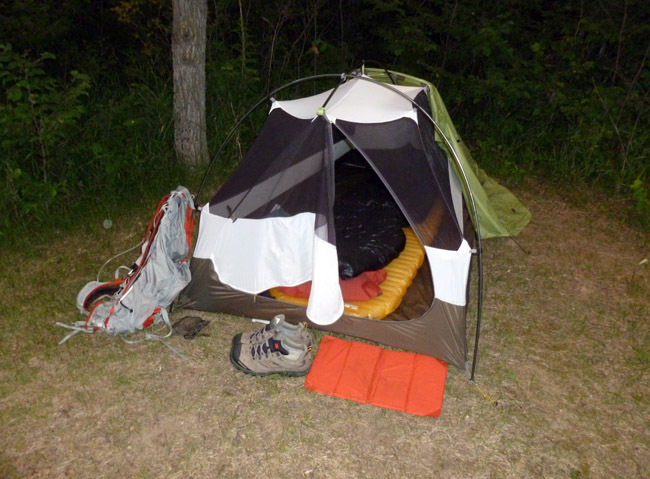 I have used the XLite pad with four different tents on approximately a dozen two or three-day backpacking trips, and one camping trip (seen above), most in Minnesota (MN). I have at least 26 nights on it since last spring that I can remember. 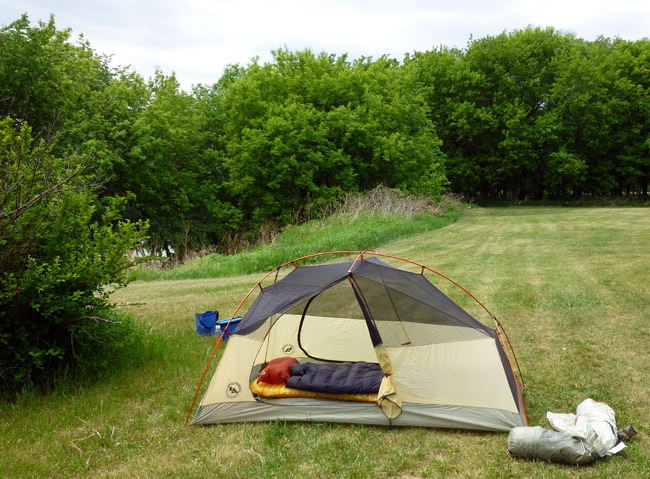 Locations in MN to start off have been along the Red River of the North near Hendrum and Halstad, Paul Bunyan, Two Inlets and Smokey Hills State Forests, Chippewa and Superior National Forests, Lake Bronson and Old Mill State Parks and on the Superior Hiking Trail. Low temperatures during use have ranged from 34 F (1 C) to 50 F (10 C) in conditions from sunny, hot and humid to stormy and raining. Terrain in MN is mostly good soil with rocky areas near the lakes, and a lot of rock on the Superior Hiking Trail. Here is a picture taken at Lake Bronson State Park. 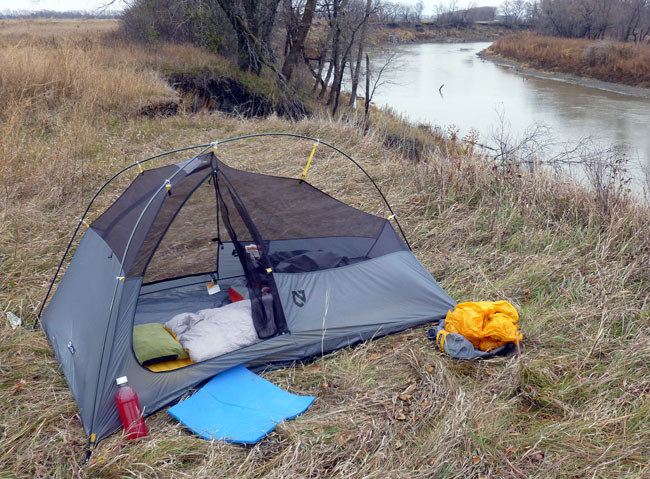 It was also used in North Dakota on an overnighter on the North Country Trail at its western terminus at very windy Lake Sakakawea State Park and for four days of hiking on the Maah Daah Hey Trail in Sully Creek State Park, the Little Missouri National Grasslands, and Theodore Roosevelt National Park (south unit), all in North Dakota. The terrain was similar at all locations, chopped grass/weeds and the low temps were around 55 F (13 C) with high humidity. Back in MN the next use was a five-day trip deep in the Superior National Forest, right by the Canadian border. I volunteered to help the United States Forest Service (USFS) build a bridge over Bridal Falls on the Gunflint Trail, The first night I stayed on the grassy USFS heli-pad next to the Cross River. The next two nights were spent on an island in the eastern end of Gunflint Lake that we used as a base camp. The last night the XLite pad got to take a break as I stayed in the USFS bunk-house in Grand Marais. The low temperatures on this trip were about 35 F (2 C) and the terrain was rocky dirt. It rained all but the last day. Next was 137 miles (221 km) of the Pacific Crest Trail (PCT) in California, consisting of two overnighters to catch sections skipped in the Angeles Forest and Sequoia National Forest, then a 5-day section to continue the trail in the northern Sierra Nevada, ending up at Emerald Bay on Lake Tahoe. The coldest temperature during use was 34 F (1 C) and the warmest night only got down to 50 F (10 C). Terrain was rocky and some was high desert. Last were two overnighters in MN on the Red River again near Hendrum and Halstad trying to find snow. The coldest night saw a low of 26 F (-2 C). This is a picture taken before I put the fly on near Halstad. As may be seen by the locations listed above I was able to give the XLite a pretty thorough workout this year. I came away even more impressed than ever with these pads. I was concerned at first that I may not care for the new tapered shape but it worked out just fine. 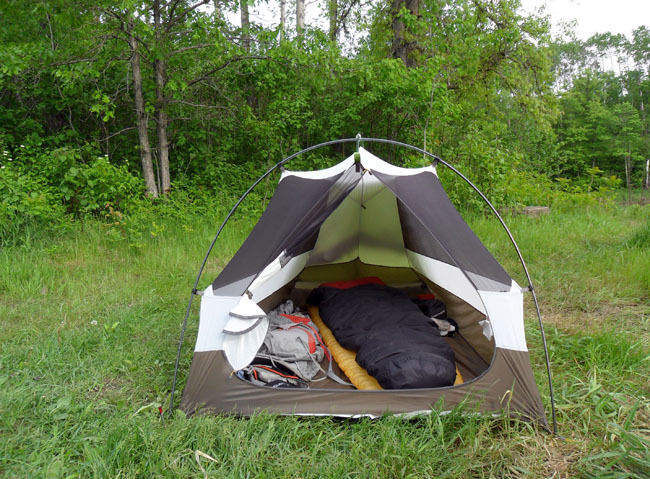 Every bit of use with the XLite was with a quilt, not a traditional sleeping bag. So I was sleeping directly on the pad. I am a side-sleeper so I find that the pad is most comfortable when it is not inflated full (or hard). This allows my shoulders and hip to depress the pad a bit. Another concern was the new material being durable. I used an 1/8" (3.3 mm) foam pad under it in CA as I was in a lot of areas with cactus and lots of stickers, and did not bring a protective footprint for my tent as I was trying to keep the weight as low as possible. Here is a picture of one of the camps. This is off the PCT near Cow Creek. 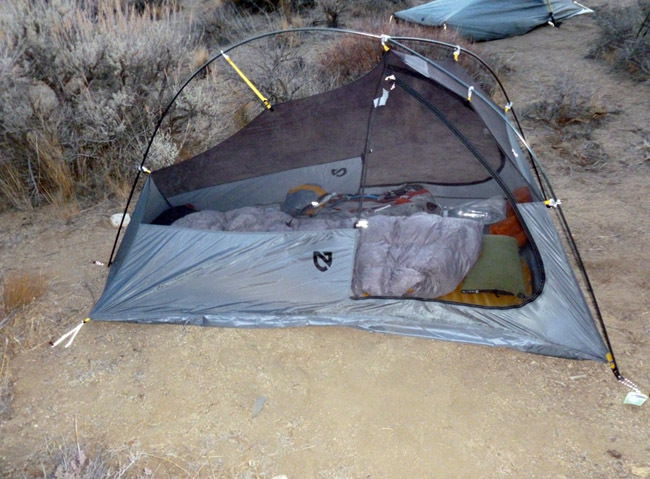 But on all the rest of the trips the XLite was used with nothing else but the tent floor under it. I toss and turn all night so the pad gets a workout when I am sleeping. Plus during my last couple of trips I was pretty much trapped in the tent by weather so I was sitting or lying on the pad for long periods of time. 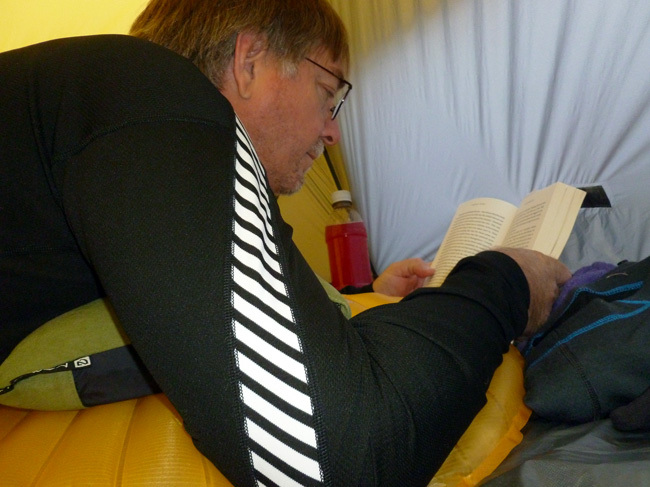 Like in this picture, the XLite is a comfortable place to hang out and read a book. It is really amazing how warm this pad is. There were a couple times I was cold on top from my quilt being a bit thin for the temps but never did I get cold from the pad. I have not had any problem with the feeling of the nylon seeing as I don't have a bag between me and the pad. But I do wear a light baselayer (like the Helly Hansen LS Crew above) to keep my quilts clean so that keeps me from noticing any "plastic-like" feel anyway. I do think that the new nylon slides less on my tent floors, even the super-slippery ones like the silnylon Hogback seen here. I have just inflated the pad by mouth on all my trips. The company's PumpSack works fine on it too (see review) but I usually don't bother until the temps get colder. When I get home I do use an electric mattress pump to blow warm air into the pad to dry any residual moisture before I put it away. The NeoAir XLite is another winner in my book. The weight and packed size in conjunction with the comfort provided make it pretty hard to beat and I expect to be using it as my regular 3-season pad for some time to come. Or until they make it better again. I leave with a picture of it at Halverson Lake.